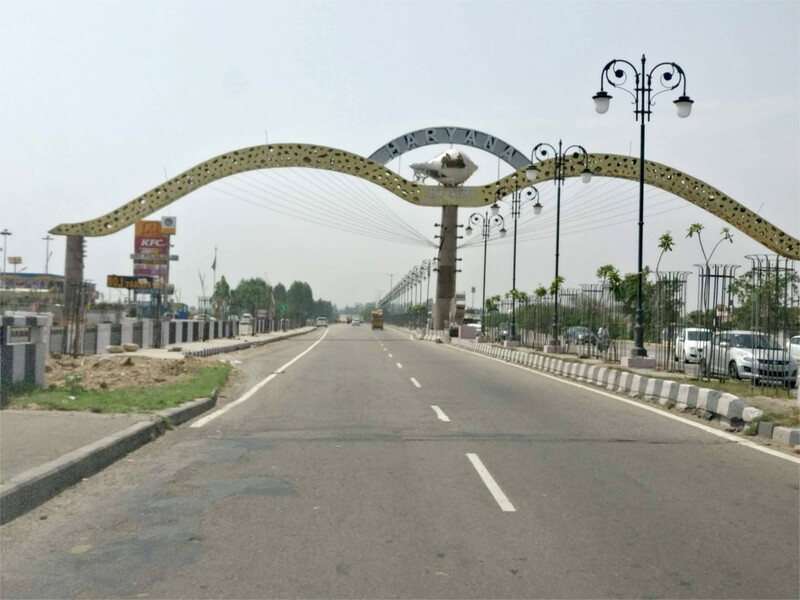 For most of the distance between Delhi and Chandigarh, you would follow National Highway 44. It turns out that this is the highway of kitsch. Finding a three-headed dragon in a parking lot, I asked The Young Niece whether it was from Harry Potter. The answer was definitely “No. Harry Potter only has a three headed dog.” This was a friendly dragon, and probably not called Fluffy. She posed under the dragon with an ice cream cone in her hand (which did not melt under its hot breath). Much before that, before we had left the gravitational attraction of Delhi, we passed this wonderfully kitschy temple. 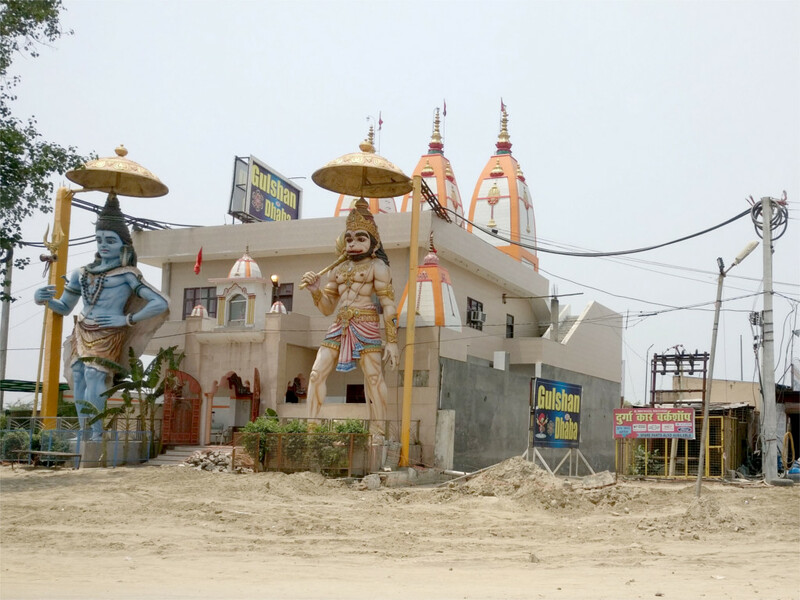 The dwarapala of classic temple architecture have been replaced by giant statues of Ram and Hanuman. I took the photo as our car flew down the highway. Later, looking at the picture I was not sure whether the structure just behind the dwarapala is a dhaba or a temple. The triple spired structure behind the cube is definitely a temple, but, going by the signboards, the cube is probably a dhaba. Our flight had landed in Delhi just after ten, and now it was getting to be time for lunch. The distance between the airport in Delhi and the center of Chandigarh can be covered in about four and a half hours, not counting a halt for food. 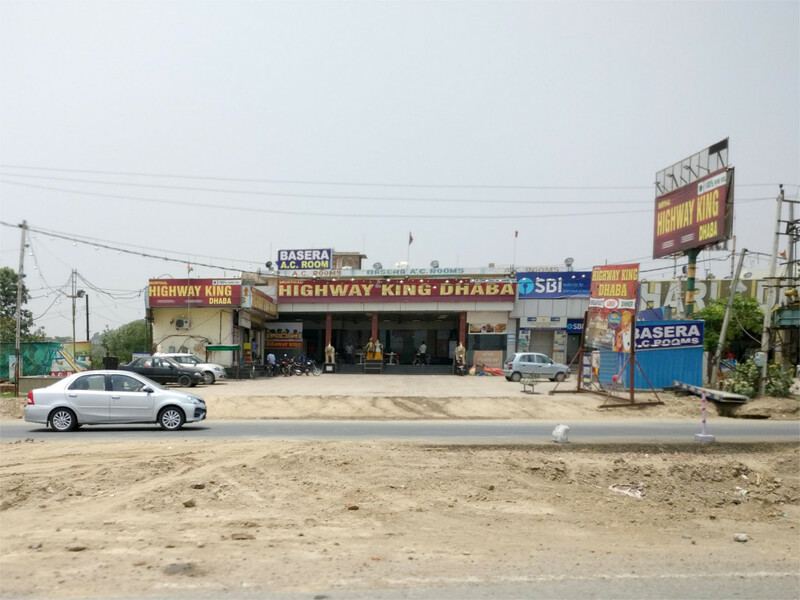 The road is lined with dhabas, but most are empty of clients. It seems that opening a roadside eatery is a popular business, but not one which is highly remunerative. All the crowds seem to stop at places which are full of kitsch like the three-headed dragon. That dhaba also had toilets which were guarded by these statues in armour: another touch which was right out of an alternate world Harry Potter. “Of course,” I told The Family, “in this part of the world it has to be Hari Puttar.” Reassured, I walked into the clean loo. The Lotus tried to put forward a different theory of the origins of these statues, but I think the Hari Puttar story is too colourful to be wrong. Even the divider between the states of Haryana and Punjab is kitschy. Just after Amabala (or before, if you are coming from Chandigarh) is this amazing state border. The highway passed below a complicated arch with the name of the state written on it in large friendly letters. On the divider was a tall pole holding up something which looked like a conch shell disguised as a submarine. Some day in the future all this might look like classic art. I wonder what the kitsch of that time might be. Negotiating the mean streets of Delhi you see sometimes the car “which is not itself mean, which is neither tarnished nor afraid.” That’s a rare sight. Significantly less rare are less-than-new luxury cars. If fleeting glimpses are anything to go by, then the Mercedes E class is becoming very popular on the roads. A quick search tells me that right now there are 270 used Mercedes E classes on sale in the Delhi region. Wonder if the car which I took a photo of has been put out to pasture yet. My flight left JFK at 3 in the afternoon. Most brunch places in New York seem to open after 11. So this didn’t leave me enough time for a nice Sunday brunch. As a result, my main meal of the day was the dinner on the flight that we had soon after we took off. As always, cabin lights were dimmed after this in order to simulate night. The movies were not very interesting. I slid up the window shutter, turned the glass to transparent and peered out. 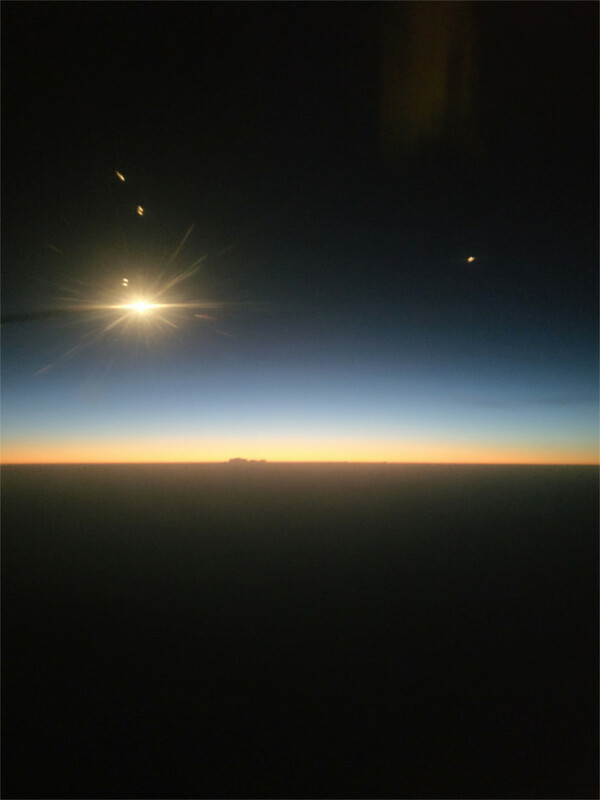 We were somewhere over the north Atlantic, a little southwest of Reykjavik. There was a sea of clouds below me. The sky had turned a brilliant blue in the approaching dusk. Ten years ago I’d managed to take a photo of calving glaciers from a flght. No such luck this time. I got myself something to drink, forced myself to watch a movie, and then fell asleep. When I woke we had crossed the Atlantic. I scrolled through the flight data and saw that we were a little south and east of Riga. I’ve never seen Riga, or the Baltic states. I popped the shutter open again. Light poured in. 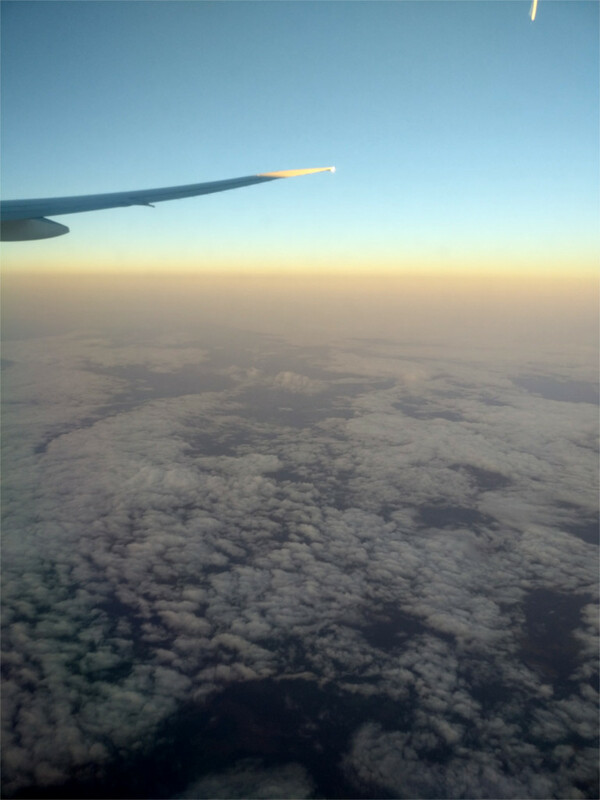 We were well above the sea of clouds which hid the north European plains below me. One of the cabin crew came by to ask me to pull down the shutter. They like people asleep. I complied, but then walked around the cabin for a while, did my stretches, drank some water. It was about 6 hours since we took off. Almost half way. The second half of the long flight was excruciating. I watched parts of five movies. I dozed, ate, fell asleep again. I walked around the cabin, through the galley and back. I read all the newspapers that were available. I finished a Simenon and started another. Eventually the flight data told me that we were near Delhi. Now there was no objection to shutters being up. I took a photo of the first clear sky that I’d seen in half a day: the monsoon sky over Delhi. I was a little hop from home. The story of Greek Buddhism seems to be largely forgotten except when events such as the destruction of the Bamiyan Buddhas hit the public’s consciousness. When The Family and I chased after a remnant of the neglected Indo-Greek cultures across a flooded river near Bhopal, I had not seen the magnificent schist statue of the Buddha in the National Museum in Delhi (featured photo). The history of the Gandhara kingdom is well documented, widely researched, easy to find, and seldom referred to. In these unsettled days the story is worth keeping in mind. The Gandhara kingdom was centred around Peshawar and Taxila, and in the period between about 200 BCE and 600 CE it was the meeting place of three cultures: the Greek, the Indian, and the Persian. It was part of the Mauryan empire. 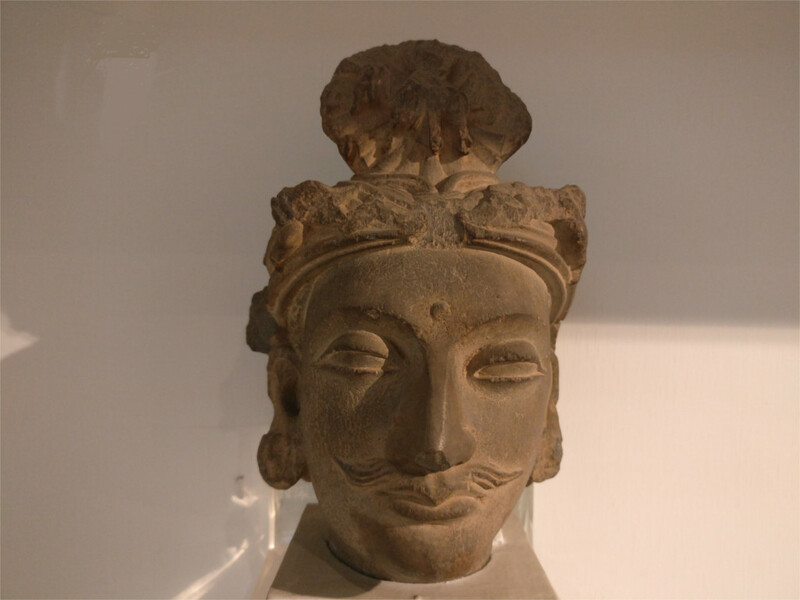 The Emperor Ashok was introduced to governance as the satrap of Gandhara, during the reign of his grandfather, Chandragupta the founder of the empire. Buddhism came to Gandhara (and to the rest of empire) with the conversion of Ashoka. The influx of Greek artists and artisans to Central Asia which started after Alexander’s conquests settled into a constant exchange during the Seleucid dynasty, with spillage into the Mauryan empire. The Indo-Greek melding which created the style we call Gandhara arose during the 1st century CE, during the reign of Kushan kings. The featured photo is of a magnificent example of this style. 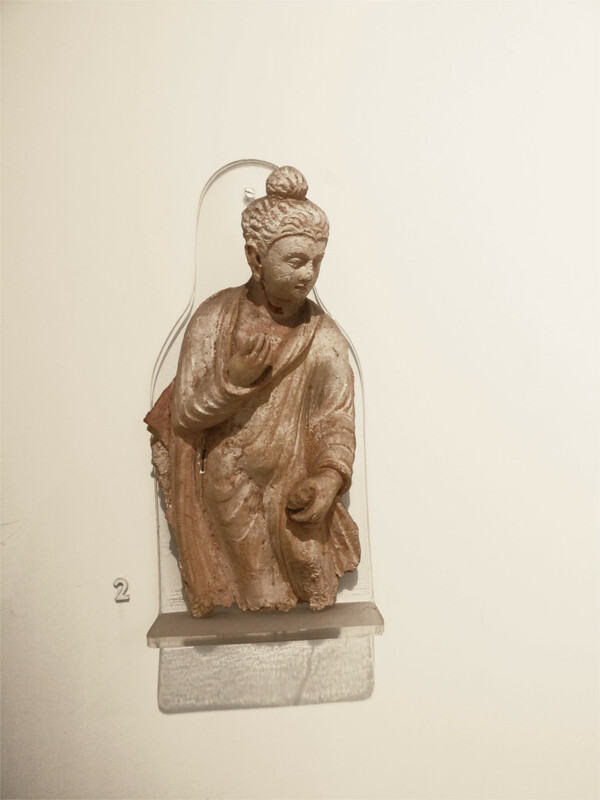 Another one which I liked is the plaster statue of the standing Buddha pictured here. The Kushan kings traded with Rome, and the influence of the imperial Roman style is clear in both the statues. The faces of the Buddhas and the flowing dresses remind me of the flowing robes of 2nd century Roman sculpture, and the faces of Apollo. The statues were often painted and occasionally gilded, but I could not see any trace of paint on the ones I examined. The head of a Bodhisattva that you see above was striking (in spite of being badly lit). The label did not say much beyond the fact that this is dated to the 2nd century CE. A little search later convinced me that this must be a representation of the Maitreya. He seems to have been very popular in the Gandhara tradition, perhaps almost as much as Gautama. The Maitreya sports a mustache in all the pictures that I saw. The ascension to the throne of the Kushan Emperor Kanishka, who ruled during the period these three artifact were made, dates the beginning of the Saka calendar, the official calendar of the Indian state. Kanishka’s empire extended as far east as Pataliputra and northwards up to Turfan in present day Xinjiang province. Trade with Rome in this period opened up the silk route and is said to be responsible for the spread of Buddhism into China. I understand that "most of the archaeological finds of Gandhara art have been the result of casual discovery or clandestine treasure hunts". This explains the lack of provenance that I noticed in the labels in the museum. In the absence of modern field data, expert opinions on the history of Gandhara art diverge from each other. Unfortunately, this is a part of the world where the major archaeological sites of Peshawar, Taxila, and Swat valley in Pakistan and Jalalabad, Hadda and Bamiyan in Afghanistan have become less accessible. New scholarly expeditions seem to be unlikely in my lifetime. The full story of the flowering of an Afghan-Greek-Iranian-Indian melding will only emerge in a gentler future. A non-artist like me thinks of animals as they are normally shown in photos or paintings. This iconography, the way of representing animals, differs only slightly across the Eurasian continent; cheetahs painted by Delacroix differ slightly from those shown in Mughal miniatures. But when you come across a representation from a entirely different culture, you realize with a shock that there are other ways of seeing. The four and half thousand year old tiny terracotta head of a bull that you can see in the featured photo shocked me, when I recognized what I was looking at. This was, literally, an eye opener. The Family and I were in Delhi for a baking hot weekend, and took refuge in the Indian Museum one afternoon. 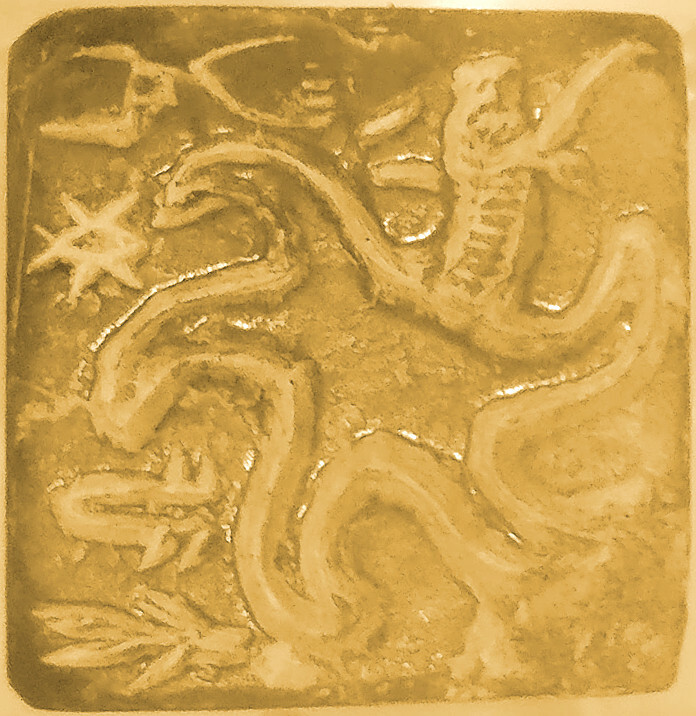 I had wanted to go there for long, and The Family wanted to go back and see the Indus Valley galleries. At its peak, this civilization spread far beyond the core Indus river valley, to cover a region from Afghanistan to modern day Himachal Pradesh and Gujarat in India, and supported a population of about five million people. The high period of the civilization is usually taken to be 2600 to 1600 BCE. All the photos you see in this post are of artifacts from this era. The representation of oxen, widely observed farm animals, are beautiful. They emphasize the massive power of the beasts. It is remarkable that this degree of beautiful modelling is visible in a tiny piece which is less than 4 cms in size. That is the larger piece. The smaller one is a little larger than a cm! If we persist in thinking about the Indus civilization in terms of land area and land routes, it is blindness on our part. The Indus people were sea farers. 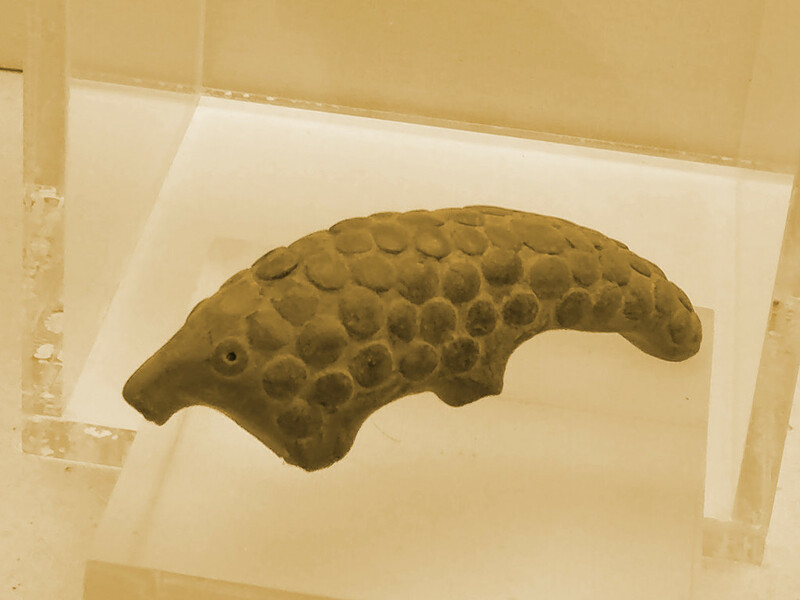 Water trade between Indus cities played a major role in commerce and full-fledged ports for sea-going vessels have also been excavated in Gujarat. I saw a seal (larger than life sized picture here) with clearly marine motifs: a starfish surrounded by fish, an eel and seaweed. When I first looked at the little figure which you see at the top of this image, I thought it was a deer or an antelope. The Family read the label and exclaimed "Rhino!" Indeed it is, as you can see from the horn sprouting from its forehead. The massive body is the second, and relatively minor, clue. The other figure is a farm animal, as you can see from the decorative strips of cloth draped across its back. It took me a while to figure out what the prominent snout and large ears tell us. Do you recognize it? Another fact about this four to five thousand year old civilization which we may forget is that the towns and villages of that time were situated in the middle of cleared forests. The large-scale clearing of forests in India has happened within living memory. My parents remember seeing herds of antelope from a passing train, or a leopard slinking away from the headlights of a car. 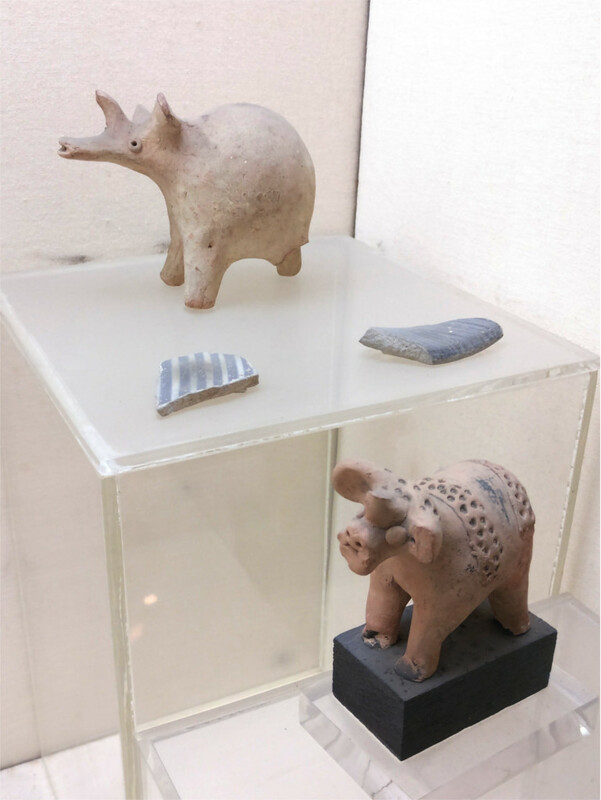 The Indus civilization left reminders of its highly forested environment in numerous tiny terra cotta figures of wild animals. The armadillo you see in the photo above is just one example. 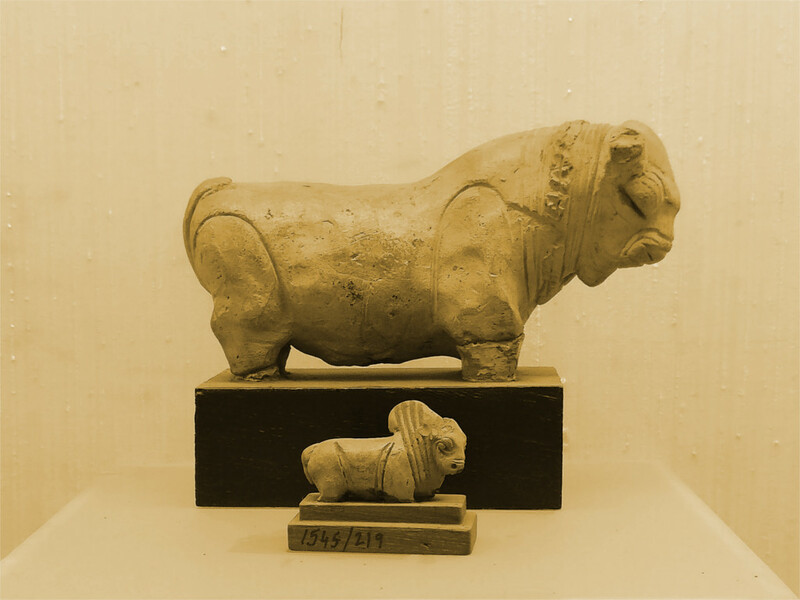 The collection of the National Museum is vast, and we spent more than a couple of hours just peering at the tiny terra cotta seals and figurines in the part of the museum which deals with the Indus valley civilization. It will take us the reminder of our lifetime to walk through this museum. I’d never been to the National Museum in Delhi, although it had been on my bucket list for years. For over fifteen years, The Family has had a false memory of the place being very small. So when we had a weekend in Delhi together, we took a couple of hours to walk through a small part of it. One of the galleries which we visited was of miniature paintings. It is an enormous collection. The range dwarfs every other collection I’ve seen. The beautiful Jain manuscript of which the featured photo is a detail was a style I’d not seen before. I don’t know much about Jain mythology, but it seems to have remarkable parallels to Buddhism, while also being different. The dreams of the mothers is part of the common lore. This was painted on paper in the 16th century CE. The paper and paint are remarkably uniform. Photography is freely allowed in the museum, but then the glass in front of most paintings makes them hard to capture. Some part of the uneven colouration in these photos is due to reflections from the glass. This picture of the emperor Jahangir is unusual in many ways. 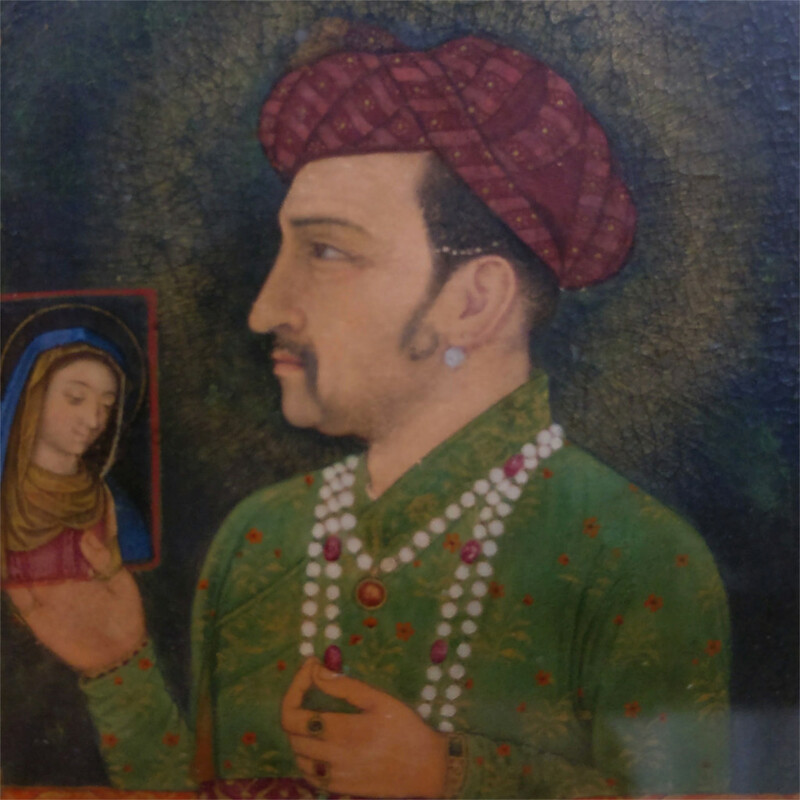 Although Roman Catholic orders were seen in the tolerant Mughal courts from the early 16th century CE, paintings with Christian subjects remained uncommon. This 17th century painting is even more so in that it shows the emperor himself with a picture of the Madonna. There are probably three or four such paintings of the Mughal emperors with the Madonna. I also found this painting a little different from most Mughal miniatures in the very subdued palette: very muted and dark colours. Another of the paintings which caught my eye was a Persian miniature. It was a fairly common kind of painting, with many different identifiable birds, animals and flowers. The reason it caught my eye was the picture of a rose-ringed parakeet (Psittacula krameri). 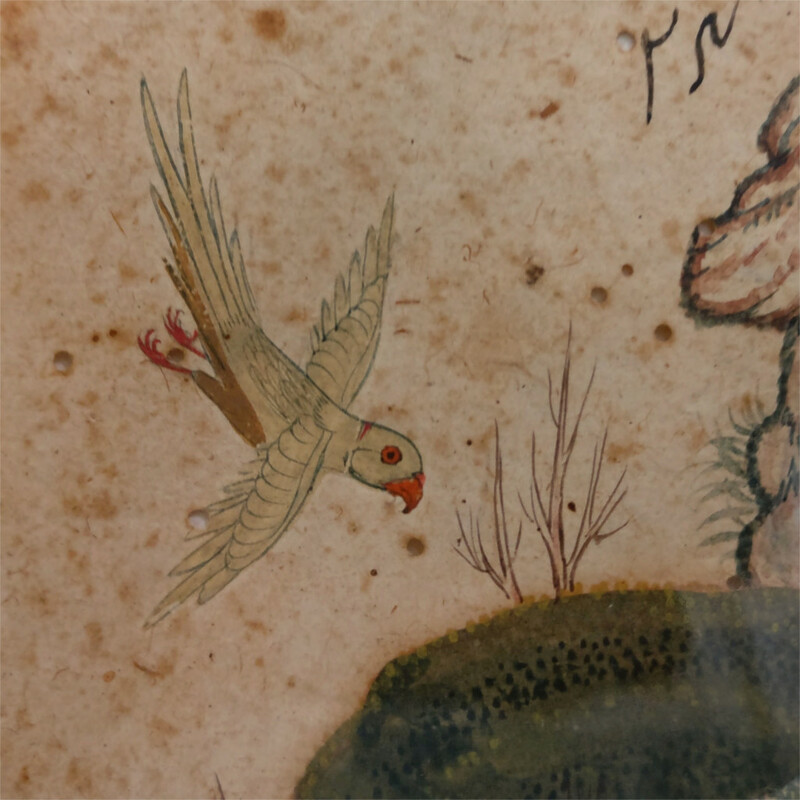 This parakeet is said to have been found in large parts of India and modern-day Pakistan, Burma, Bangladesh and Afghanistan, as well as in a wide swathe across the northern part of sub-Saharan Africa and the Gulf. Although there are reported sightings in Iran, it is not usually said to be part of the ancestral range of this bird. Is this painting perhaps proof that it was found in Iran already in the 15th century CE? I’m afraid The Family and I are not very good museum-goers. We weave back and forth through the galleries and talk too much about things like this. On recent visits to Delhi I’ve managed to catch up with This Niece who’s studying architecture. When I told her about dinners at the India Habitat Center, she said she wanted to come with me the next time I went. So one hot afternoon this weekend we went for lunch at the IHC. Go out in the midday sun. 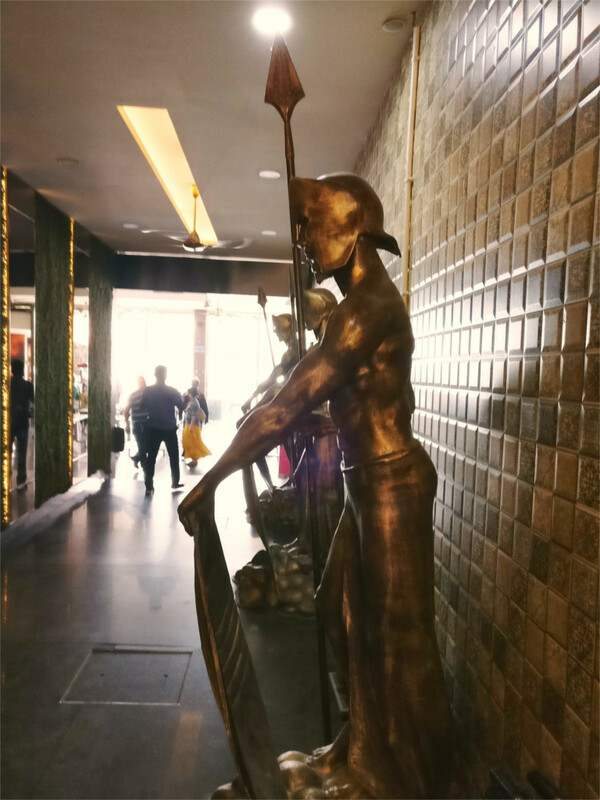 While the rest of Delhi was baking in the super-40 temperature, there was a breeze through the linked atria of the centre. As we walked through them, The Family and I looked at the organizations which have their offices there: Housing Development and Finance, The Energy and Resources Institute, the NCR planning Board, are part of an interesting set of environment, planning and development organizations which sit there. The radical building from the early nineties is typical of the architectural practice of Joseph Allen Stein: the brick facade broken by the tiny accents of coloured tiles whose differences mark which atrium you are in, and the remarkable melding of inside and outside. This Niece walked around exclaiming about this feature and that: the framework with sunscreens which you see overhead (featured photo) came in for several comments. The Family remarked on how that lets in enough light for plants to grow by. We stood and watched a group of young people preparing a stage for a play in a sunken amphitheatre built into one of the atria. Eventually we left when we ran out of water to drink. I was so tired of travelling in the last two weeks that I stopped packing my camera. So, when I found myself sleeping on the seventeenth floor of a hotel in central Delhi, I was not really prepared to take a photo of my unusual location. Why unusual? Because Delhi is largely made of low buildings, which race across two neighbouring states, assimilating villages like the Borg. Only central Delhi grows upwards. The profits involved in building high in this tiny area are such that the stringent rules about safety in an earthquake-prone area do not deter builders. My hotel room was deep with a narrow floor-to-ceiling window. Many lights needed to be kept on constantly to make it liveable. The thick heat-retaining walls required more electricity to cool it. Like all modern hotels, the structure was completely sealed off from the external world. The yellow and red buildings which you can see in the featured photo seem to be similar in spirit (although window air conditioners in some of them are incongruous). The building with hexagonal openings on alternate floors is a bureaucratic nod to "Indian" design which gone out of fashion. Every building I could see went up beyond seven floors. I counted eleven floors and more in many of them. I was in one which went up beyond twenty. Delhi is definitely growing up! 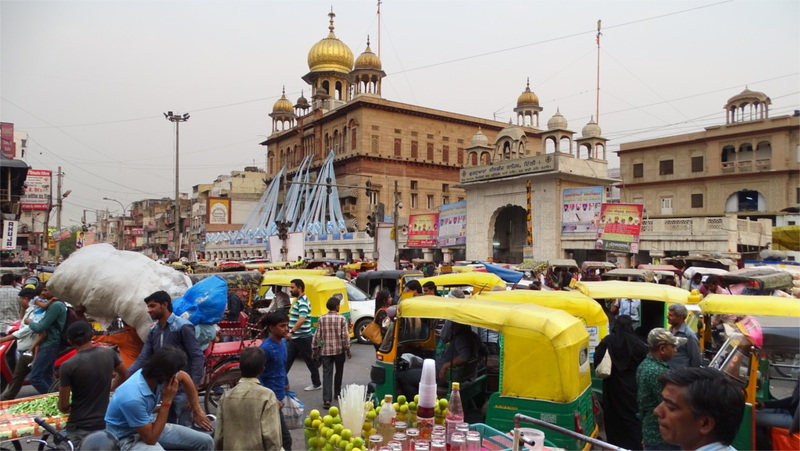 Chandni Chowk was the centre of Delhi after Shah Jahan moved his capital to the walled city in 1639, and before Imperial Britain built a new capital a few miles to the west in the early 20th century. This is the area west of the Lahori gate of the red fort and north of the Jama Masjid. 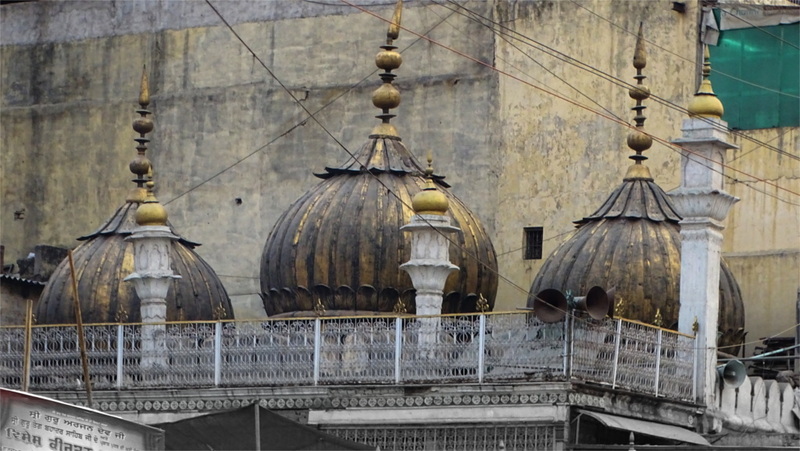 A walking tour of Chandni Chowk naturally starts from the Sunehri Masjid: a beautifully proportioned mosque with golden domes in old paintings, now fallen on hard times. If the story of Nadir Shah standing next to the domes on the roof of the mosque to survey the massacre of a panicked Delhi which he had commanded is true, then at one time it would have dominated the area. Now, as I emerged from the exit lane of the Chandi Chowk metro and looked at the mosque this was no longer the case. Mughal architecture blended use with aesthetics; when the mosque was built the space was surely sufficient for the devout. That aesthetics is completely lost in the extensions made to the mosque in order to cater to the increased population. More striking today is the Sis Ganj gurudwara which stands next to it. It must have been a special day; the gurudwara was decorated with balloons and buntings. I realized that a large part of the crowd in the Metro was headed here when a young mother of two finely dressed children asked me which exit led to the gurudwara. I’d just read the directions, so I was able to tell her to take exit 5, as I did. A gurudwara was first built here in 1783 CE, in memory of the ninth Sikh guru, Teg Bahadur, who was beheaded here on the orders of Aurangzeb. The present structure was built in 1930. I discovered the news, known to all Delhiwalas, that the gurudwara has become a bit controversial recently by building unauthorised extensions. Traffic barely moves in this crowded road, there’s such a muddle of bicycles, cars, rickshaws, carts, three-wheelers and pedestrians. Notions of lanes and priority perhaps never arose in the days when this area was less densely populated, and were never internalised later. The chaos and cacophony gave me ample opportunity to do surreptitious people watching. 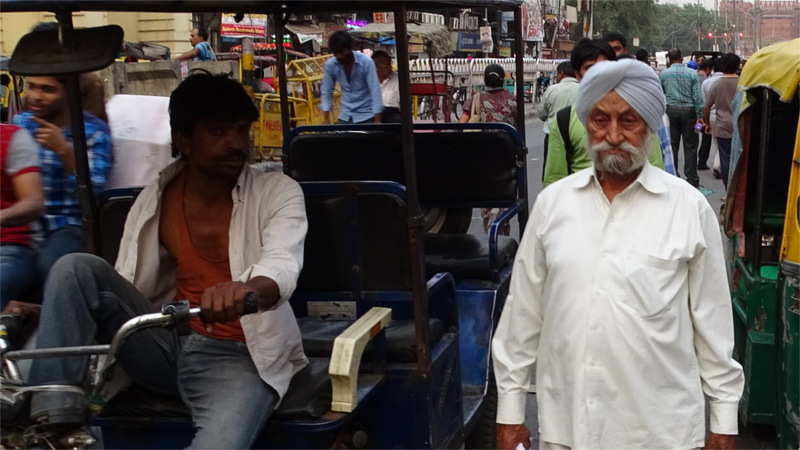 I liked this forbidding old Sikh gentleman in white striding down the road, ignoring the traffic. Even the young rickshaw-wala in the photo seems to be a little wary of him. Instead of walking on to the Red Fort, I turned right on Dariba Kalan. It is not hard to find: the lane runs between a lovely but crumbling red building with a post-office, and the area’s most famous jalebiwala. I’ve already written about this little eatery. 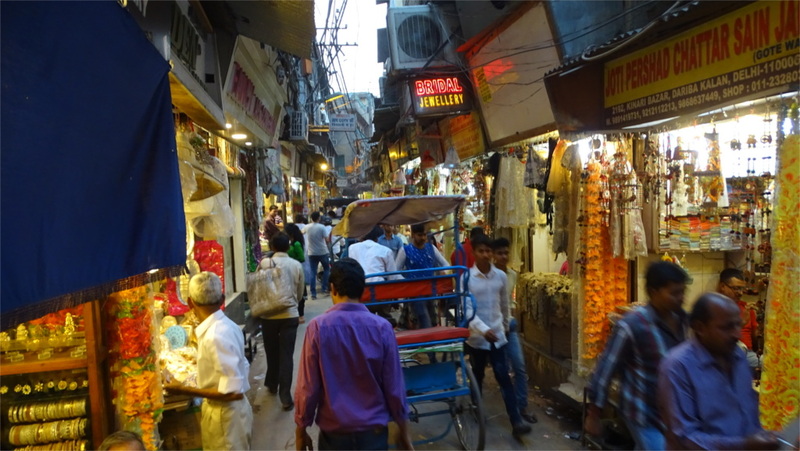 I walked through this narrow lane and turned into the longest bling market in Delhi: the Kinari bazaar. Tourist agencies try to push this as a market destination. In fact, only a movie or wedding set decorator would shop here. It is interesting to walk through this crowded bazaar just looking at people and their lives. I’d chosen a time when the sky was beginning to get dark, and the lights in the shops were coming on. Crowds were at their lowest; it was getting close to the time for an evening snack. Every few steps there was a little shop selling kachoris and samosas. Judging by the crowds, it doesn’t look like any shop is particularly better than another. Each seems to have a few regular customers and a few walk-ins. 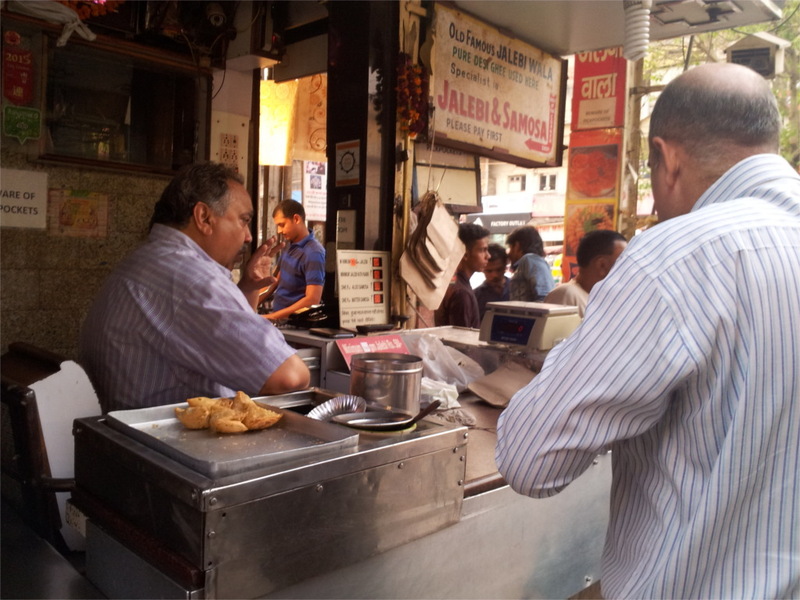 The shops don’t seem to innovate either: they concentrate on getting the kachoris just so, for their loyal followers. There are probably neighbourhood rivalries about which shop has better food. As far as I could tell, it would need a lifetime of training your palate to tell the difference between them. This is a world so far removed from that of malls and food courts, that it is a wonder that the two exist in the same city at the same time. If you are a student of architecture, then there are gems hidden away inside these narrow and smelly lanes. 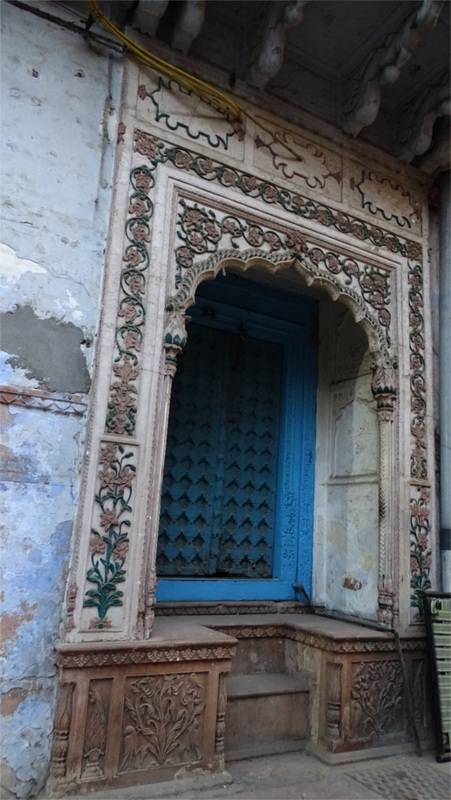 I peered past a gate which led off to a side lane and discovered a beautiful building with a blue door (photo above). Elsewhere a grand building with lovely arched verandas (above) was partitioned into tiny apartments. Stylistic differences which are visible even to an untrained eyes like mine would probably enable a knowledgeable person to peel away the centuries and imagine the area as it evolved over time. If someone offers a walk through this area to show such visions, I will queue up to take it. In its absence I go back every decade, after a little more reading. Delhi takes its food seriously. The area around the Red Fort in Delhi was populated during Mughal times. It has seen the sack of Delhi by Nadir Shah in 1739, and again by John Nicholson in 1857. 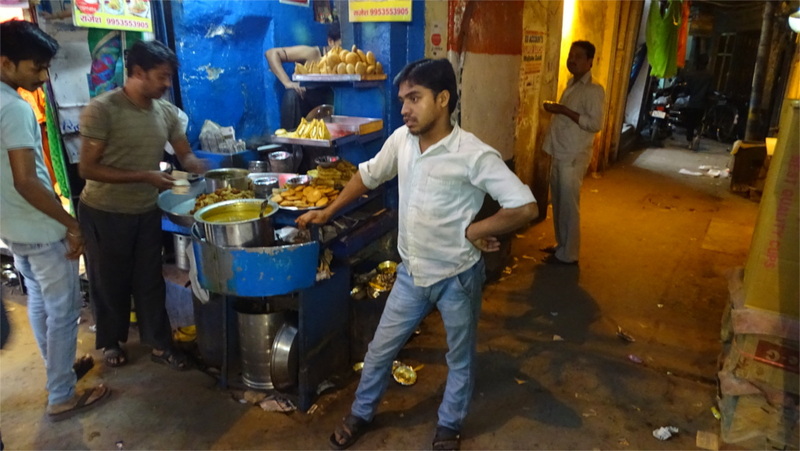 The oldest food stall in this area was reputedly Ghantewala’s sweet shop, which claimed to have been founded in 1790. On my visit to Chandni Chowk a couple of days ago, I was told that it has shut down. So I walked into a shop selling parathas in the little street called Parathewali Galli. It claimed to have been founded 15 years after the second sack of Delhi. It may not be the oldest establishment in the neighbourhood, but, like all the shops here, it has gone beyond the potato and cauliflower fillings which you get in most towns. This new age paratha comes with fillings that run from karela (bitter gourd) to okra to bananas. I wouldn’t have guessed that some of it is edible, but they were a pleasant surprise. It is definitely worth trying out, especially if you have been eating the old parathas all your life. 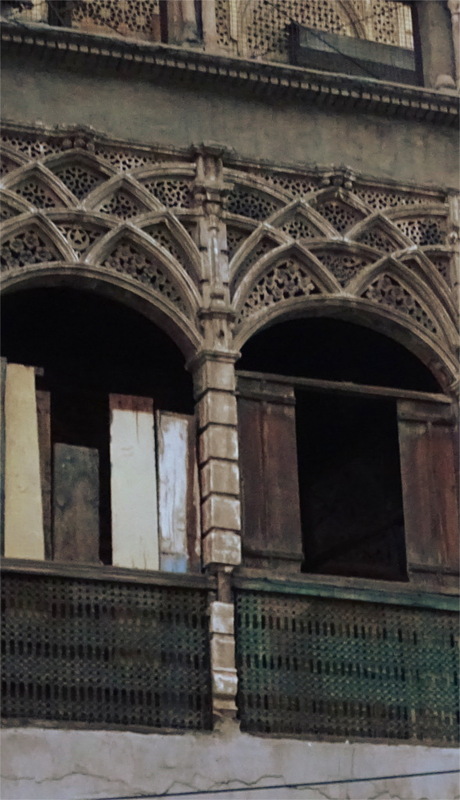 Another old eatery in the same general area is the jalebiwallah near the Chandni Chowk post office. This claims to have been in this place since the mid 19th century. It has no lack of clientele. I was in a queue behind a couple of other tourists, who seemed to be Tamilians. While tourists try to make up their minds in the slow queue, the regulars get quicker service on the side. This is a standing only place. The Tamils took their jalebis and rabri off to a parked car. I had my jalebi standing at the corner. There is a drum nearby where you throw the paper plate, and a little tap next to it where you can wash your hands. I loved fact that the food came with this convenience. 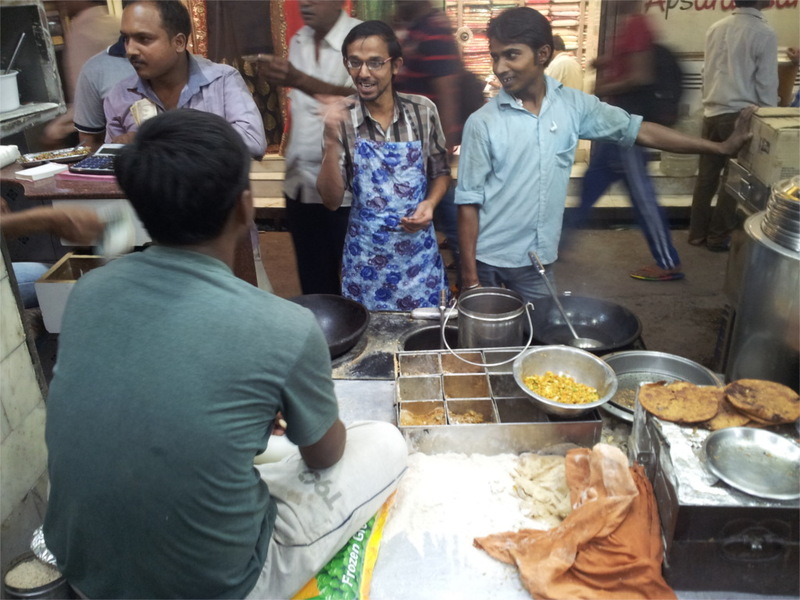 When it comes to food, the Delhiwala is not insular; he will try out imports. Momos became popular in the 90s. 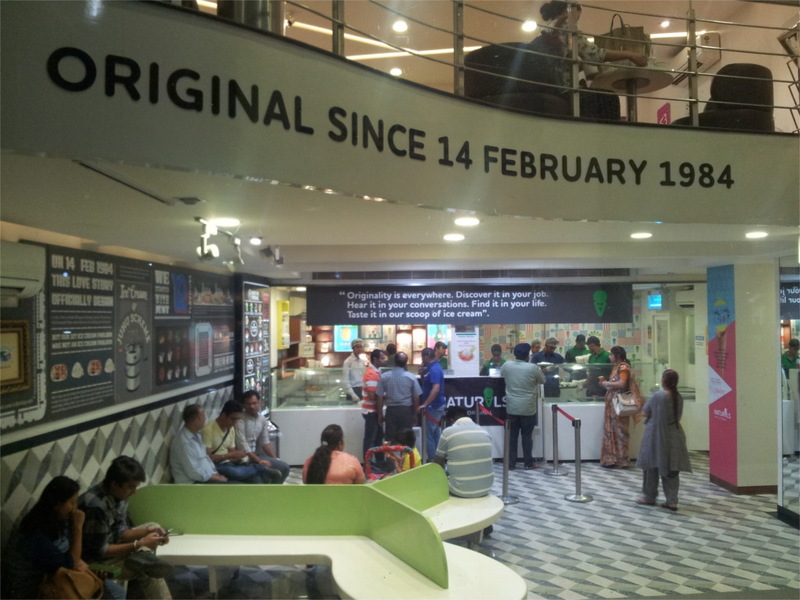 Now, the Natural Ice Cream chain from Mumbai has made an entry into the posh outer circle of Connaught Place. I’ve never seen a Natural Ice Cream store in Mumbai which is half as big. This one sprawls across two floors, and seems to be perpetually crowded. I tried my favourite classic flavours: a scoop of fig and another of musk melon. They seemed to be the same as the Mumbai version. The first Naturals was the tiny hole in the wall in Juhu which started in 1984 and still does business. The franchises in Delhi started only in this decade. Amazing that you can eat your way through more than a century of food styles in one evening in Delhi.